I never expected to be a widowed parent. I bet you didn’t either. Do you ever wish you had a handbook showing you what to expect in this thing called ‘only parenting’ or ‘solo parenting’ ? Access to experts, people who have great ideas, people who can tell you what you need to know, and what to look out for? It all started for me when my husband said one evening that he’d been feeling a bit dizzy. No big deal, right? Call the doctor, get to the bottom of it…boom…fixed!? Not quite. A simple trip to internal medicine and an MRI turned into brain surgery two days later, followed by a diagnosis of brain cancer (glioblastoma … same type as John McCain, Beau Biden, Teddy Kennedy). And then 8 months of cancer & caregiving, and then he was gone. And I was left to pick up the pieces of what should have been our life. Now it was me, my 9-year-old, and my 11-year-old. Don’t you wish that existed? Well, I decided to go looking for the answers. And invite you along on the journey. It all starts with the podcast. I’ve been kicking this around for over two years, trying to figure out what approach would make sense. Because I’m not a therapist or a grief counselor. What I am is a fellow widowed parent on a mission … a mission to help my kids to somehow thrive in spite of their terrible loss. And, I realized that now was the perfect time to tackle this. You see, after nearly 20 years in the tech industry, I’m on a career sabbatical. And then I realized that I’m like the “Kevin O’Connor of widowed parenting.” Who is Kevin O’Connor, you say? Fans of This Old House will know. He’s the current host. Unlike the two previous hosts, they picked him specifically because he was not an expert. Because, as an enthusiastic DIY homeowner, he could represent the viewers. Ask questions of the experts that a homeowner would ask. Kind of stand in the viewer’s place in the show, and bring what he’s learning to them. I read alot. Talk to people who have been down this path. People who write books and who practice in the field. I interview them for the podcast … and bring you the best advice & info I can find. And you can listen in right from your phone as you go about your day. Or even on Alexa as you fix dinner. 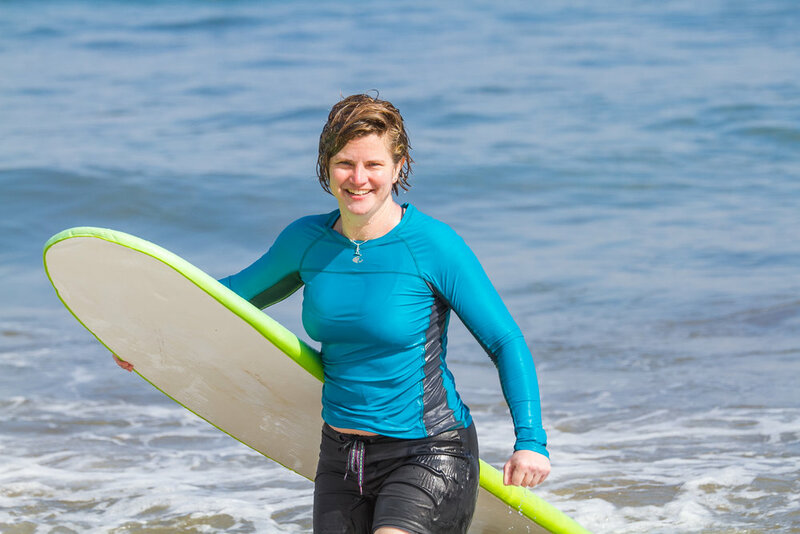 I went to a women’s surf camp in Mexico for my 45th birthday. A year after my husband died. And I got up on the first wave, and surfed all the way into the beach. (Hmm … maybe I should conveniently fail to mention that that it was all downhill from there … ?!) It was an amazing experience. I still wear the surfer necklace I bought on the beach. In fact, I almost never take it off. Need something built? Great. Need the disposal replaced? No problem. But I absolutely hate yard work. And that was supposed to be my husband’s thing. I was born and raised in the Seattle area. I’ve also lived in Oregon, DC, and New York. Been back in Seattle for a decade now. I met my husband because I’d started a little business making web sites. I made one for his office. Way back in 1996. The early days of the internet. Like actually typing html on a screen and hoping it worked. And then fixing typos until it did. On my “Hundred Dreams” list is riding a camel. And milking a cow. And raising $44,000 for brain cancer research … in memory of my husband’s 44 years. Curious what I’ve learned so far about widowed parenting? We respect your privacy. We will never sell, rent, give away, trade, or otherwise share your information.